Apartments Gsenger 70sqm large apartments (2-6 persons) for the holiday with your family! Per dwelling: a triple, a double living room with comfortable couch and TV, kitchen with stove, microwave, coffee maker, refrigerator and a freezer kettle, shower and toilet are separate rooms, lobby and a large balcony and nice garden with terrace and stunning views on the Tennengebirge. Internet access with WLAN (free) bed linen, hand and bath towels are available. Ski room and miniature ponies for the children and 3x covered parking for your car. Town and location of accommodation : Town and location of accommodation Our house is situated in a quiet, sunny location 1.5 kilometers from the center Abtenau, the capital of the Lammer valley. An idyllic trail takes you into the center of Abtenau. 3 minutes is the nearest inn, where we also serve typical Austrian dishes. The cross-country ski trail runs past the house. The Abtenauer cable cars (priced family cards) with summer and winter toboggan run 1km. 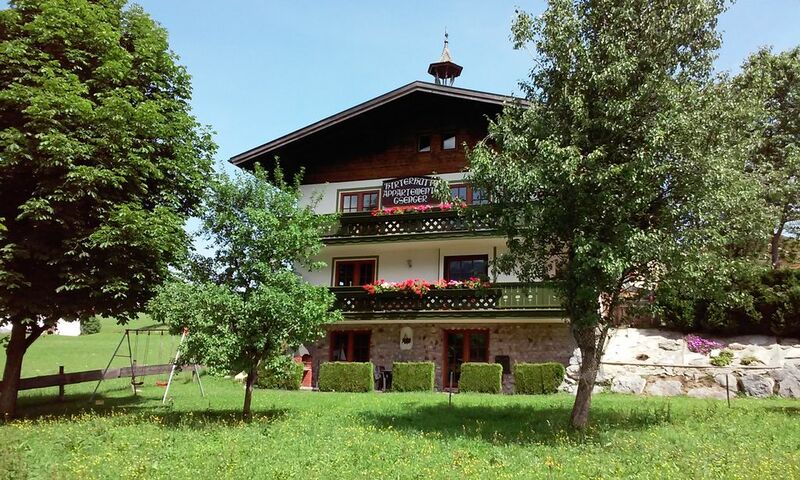 1.5 kilometers to the Sonnleitenliften with a wonderful ski school and nursery slopes. The free ski bus (bus stop 200m) takes you to the ski area Dachstein West 9km away. With the ski bus to the affordable family ski Postalm. (panoramic trail) is only 35 minutes drive to the festival city of Salzburg. Abtenau, Salzburg and its surroundings, Salzburg, Austria Relax and unwind in Abtenau in Lammertal - Salzburg, magnificent mountain scenery, rivers and lakes, hiking and mountain biking trails, cross country skiing paradise. In winter, Abtenau one of the finest family ski resorts in Austria. With a modern cable car you drive in summer and winter for skiing, hiking, summer and winter tobogganing to lofty heights. Rest and recreation, sports and active holidays in the mountains, sleigh rides. Visit the largest alpine area in Western Europe, the Postalm - for hikers, climbers, skiers, cross country skiing, mushroom pickers. Riding and tennis center, outdoor sports (rafting, canyoning and much more to enjoy.) Culture and nature trips to the festival city of Salzburg, the Salzkammergut (Wolfgangsee, Lake Hallstatt), Lammerklamm, caves, ice caves and much more. Comfortable 70sqm two large apartments (2 bis6 people) for the holidays with your family! Internet access with WLAN (free) bed linen, hand and bath towels are available. Ski room and miniature ponies for the children and 3x covered parking for your car. We waren in juli daar, schoon huis en rustig gelegen . Mooi uitzicht vanuit balkon . Zeer vriendelijke gastvrouw. Alles was eigenlijk perfekt , heb niks te klagen. We haden echt een mooie tijd daar. Insgesamt geben wir hier gerne die Bestnote ab. Es war alles stimmig und wir haben uns bestens erholt. Ansprechende, qualitativ gute Einrichtung. Auch ideal für Familien mit Kindern. Wir haben uns hier sehr wohlgefühlt und empfehlen es gerne weiter. Die symphatischen Vermieter, die bei Bedarf immer hilfreich zur Stelle waren. Eigener Schistall, Trockenmöglichkeit für die Schisachen im Keller, überdachter Parkplatz. Wir waren im Winter da; aber ich denke bzgl. des großen Freizeitangebotes bietet jede Jahreszeit etwas. Fürs Skifahren ist dieses Gebiet bestens erschlossen. Ein sehr gut ausgestattetes Loipennetz, für Anfänger als auch Profis. Wir können die sehr gepflegte und geräumige Ferienwohnung nur empfehlen. Gemütliche helle große Wohnung mit zwei Schlafzimmer. Wir haben mit 2 Kindern hier eine sehr schöne Woche verbracht. Das Haus ist Familienfreundlich und hat ein sonniger, ruhiger Lage. Ein wunderschönes Panorama, Internet (WLAN) überdachter Parkplatz und Großer Garten mit Kinderspielplatz. Alles hat gestimmt, und deshalb werden wir sicher wiederkommen. S pobytem jsme byli naprosto spokojeni, bylo to bezvadny, muzeme jen doporucit.